Why do Ukraine need a brand new transport strategy, what key points should it contain, when will the final edition be ready, and what is the mechanism of its implementation – Philippe Burghelle-Vernet, transport expert of Support Group for Ukraine, in an interview to the CFTS. Ukraine's National Transport Strategy project will be discussed today in convention center "Ukrainian House". "It will the key document that define the future development of transport infrastructure which becomes the locomotive of the Ukraine's economy," –Volodymyr Omelian, infrastructure minister, told once upon a time in summer. Such document is definitely necessary but what it will be is another question. The development of the strategy is going with a help of EU, namely Support Group for Ukraine. We ask Philippe Burghelle-Vernet, transport expert of the group, to explain what the National Transport Strategy of Ukraine should contain and it should be done for its implementation without transforming it into another useless paper. What key points should the National Transport Strategy of Ukraine contain? The existing National Transport Strategy of Ukraine (NTSU) being adopted in 2010 and that being acted until 2020 contains a lot of appropriate ideas. However, this document is lacking of global vision and consistency. It mixes up principles, objectives, priorities and even specific projects. Thus a clear policy direction was missing as well as implementing and monitoring mechanisms. The update of the NTSU undertaken by the Ministry of Infrastructure with a help of the EU technical assistance project should take these aspects into account. The first challenge is to establish clear and global trans-modes policy priorities whereby the Ukrainian transport system should be contemplated as a whole. And these priorities shouldn't be too numerous because too many would mean no priority. The second point is to establish the most appropriate policy mix between transport modes. Where the focus of public authorities' attention and public money should be? Rail, road, inland waterways, maritime, aviation? All of them? But in which proportions and for what purpose? And what about intermodality? What should be done within transport modes themselves? For example, building brand new motorways or repairing existing ones? I recognize it is a difficult issue to be tackled. But this is the essence of a true transport policy. The third point is to strike the right balance between internal development and external relations. EU and its Eastern neighboring partners (Belarus, Ukraine, Moldova and the three South Caucasian States) have decided to extend the European transport networks in a kind of Pan-European one. Maps for rail and road have been agreed with a landmarked focus on developing transport in terms of EU-Ukraine relations. On another side, due to its geographical position Ukraine could develop transit activities between EU and Central Asia, even China. But how far these developments could serve about the internal transport needs of Ukraine? I mean within cities or when it comes to connectivity between oblasts. It is the responsibility of Ukrainian authorities to establish here again the appropriate policy mix. Fourthly, Ukrainian transport policy should take into account its relationship with EU and should be in full consistence with EU-Ukraine Association Agreement we are both committed by. This is not only about EU connectivity but also matching with EU standards and requirements. For example, establishing free railway market as we have in EU should be also implemented in Ukraine. But these developments should be envisaged within the global transport strategy, not in isolation. Contemplating integration between transport modes is a key for the success of the strategy. The best rail complex could not be helpful for trade development without ports operations efficiency. Not to speak about modal shift to inland waterways for environment protection or energy efficiency purposes. You've told about policy mix between internal development and external relations. What have you meant? Ukrainian transport policy should be a comprehensive one. The government, Ministry of Infrastructure and other authorities should, of course, address transport policy to the needs of Ukrainian citizens, for instance in terms of infrastructure safety. The policy should also serve the Ukrainian business regardless of its specialization: whether transporting raw materials to plants within Ukraine or carrying grain to ports to be exported. At the same time, they couldn't forget about development of commercial relations between Ukraine and EU and other partners. That point includes, inter alia, focusing on bottlenecks on the transport routes between Ukraine and EU. We have a good example – Beskyd tunnel in Carpathian Mountains. It's a bottleneck on the railway between Lviv and Hungary, Slovakia, Romania to be eliminated thanks to a European Bank of Investment's loan. Another example would be attracting investors in port terminal operations. How to attribute priorities, financial resources to these various topics is the policy mix between internal development and external relations I've referred to before. Don't you think that the focus on the bottlenecks is a short-term priority, and we should think about more strategic one? For the time being, Ukraine does not have at its disposal developed enough analytical tools to establish priorities amongst infrastructure projects. What is at stake? It is to build a very good statistical apparatus and being capable of developing projections. Only with those conditions it should be possible to identify priorities on really informed basis. We are ready to provide technical assistance in this matter, i.e. the EU is preparing terms of reference to undertake a big project – establishing transport modelling and transport master plan. You are definitely right that Ukraine needs strategic priorities in terms of transport infrastructure but until this new tool produces its effect, my suggestion would be to concentrate on obvious bottlenecks like Beskyd tunnel, I just mentioned. Others could be improving port hinterland liaisons, like in the case of Odesa and Mykolaiv, building road bypasses on core network for avoiding trucks to occur in the city centers with all consequences in terms of environment degradation or urban transport congestion, etc..
During 25 years of independence Ukrainian government adopted a lot of strategies and state programs in transport industry but those documents had no real effect. What government and the ministry should do for avoiding such unreal strategies in the future? Appropriate monitoring tools, including measurable key performance indicators and reporting mechanisms should be implemented under the responsibility of public authorities. But what matters is also to mobilize stakeholders. When I'm speaking about stakeholders I mean not only governmental bodies and agencies but also transport users, transport service providers, regions, cities, citizens, civil society too. Of course, all of them could have different views. That's normal. But gathering views, even totally different ones is the only way to take informed political decisions. And when you're mobilizing stakeholders, you should explain year after year what you've done and what the results are. What do you mean under mobilizing? Sitting them at the round table and talking with them about the detailed actions envisaged under the strategy: regulatory environment, pricing, fees and another kind of things. The Round Table organized on the 17th of November by the Ministry to gather stakeholders views on the strategy and the envisaged measures is a good step in that direction. But a lot of transport companies, shippers and other stakeholders often complain about government bodies. The most popular complain is "they don’t hear us!". Is it possible to adjust the interests of both sides? For me mobilizing stakeholders is also in the interest of public authorities. Their responsibility is to take informed decisions and to explain how and why they have been taken, all the more when they are difficult to take. At the same time, transport community should understand that reforms need time to be implemented. It's not a question of only weeks or months. Even of years, when it comes to issues like corruption. No need to emphasize that Ukraine cannot be transformed as it could and should be without eliminating corruption. A good sign regarding transport is that one of Minister Omelyan' Deputies is responsible for fighting against corruption. What does EU want to hear from Ukrainian businessmen? Do you realize the position of Ukrainian business? There are several complains that we hear from Ukrainian business. A strong one is about corruption. Another is about unpredictability of tariffs. Other aspects I've heard from some transport users are robbery and similar kind of things. Another issue is the predictability of the timeline for deliveries which is very crucial. Without predictability of tariffs and time delivery you are in big trouble. Customs procedures for clearance of cargo should be hugely improved and operators are keen to get rid of waste of time and corruption. There are however promising development. For instance, the implementation of the "single window" concept at Odesa custom. EU is an adviser in developing the National Transport Strategy of Ukraine. Do you feel as EU representative an efficient feedback from Ukrainian business? We have contacts with Ukrainian business, which allow understanding their concerns as the ones I have mentioned. We are also in contact with business organizations like EBA. Contacts through such organizations like CFTS are also useful. The CFTS last-year study "Industrial Survey" allowed improving our understanding of the opinion of Ukrainian business regarding transport. In addition one of the important tasks of the EU technical assistance project is to improve the coordination between the competent authorities and other stakeholders in the area of transport. You are coming in Ukraine for several years. What can you say about the current infrastructure minister and the previous ones? How is your cooperation with Infrastructure Ministry within the framework of creating of Transport Strategy? I had very few contacts in the past with Minister Burbak. So I couldn't say anything about him and his governance. But I had by far more contacts with Minister Pyvovarskyi. He was a reformist, I have no doubts. He has done a good job. I firmly believe that Minister Pyvovarskyi's would have to make things moving if he would have stayed longer. Now, Minister Omelian's, one of Pyvovarskyi Deputies and Chief of Staff is on the lead since six months. He is also clearly reform-minded and has already demonstrated his willingness to mobilize people and to promote changes. But reforms also depend on the Verkovna Rada that have to adopt now and in the future a lot of transport laws to make changes happening. Infrastructure minister Volodymyr Omelian announced that the concept of the National Transport Strategy will be ready by the year's end. Is this term real? This is the plan, indeed. I hope this time line could be kept. However, what is the most important aspect is not whether the Strategy will be finalized by the year's end or in the first quarter of the next year. The main goal is well-done job. Will this document be the final or preliminary one? We are talking about a Strategy. Subject to revision, which should of course happen when it comes to long term policies, this document should be stable. However it is only the beginning of the story which should be developed over year by implementing a number of various actions (120 have been identified at this stage). To what extent approach the creation of the National Transport Strategy in Ukraine is identical to the European practices? Is there something unique about our country? There are no true public policies without Strategies clearly expressed and agreed under public authorities' responsibility that should be accountable for their implementation and results. In that sense what is developed by Minister Omelian is quite close to EU practice. I compared in terms of structure how the future NTSU looks like at this stage and the "White Paper on Transport" the European Commission adopted in 2011. Both documents combine according of course different shapes diagnosis, challenges and vision. Moreover, in "quantitative" terms the new NTSU is largely equivalent to the White Paper strategy: 5 priorities against 4 strategic goals in the White Paper, 26 measures against 40 initiatives and 120 envisaged actions against 131. 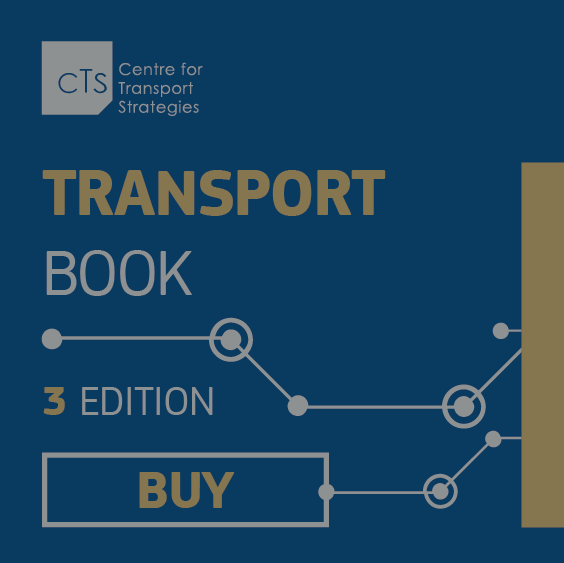 What is the roadmap of the implementation of the Transport Strategy? Firstly, the Ministry of Infrastructure has published an abstract of the Transport Strategy on its website and everybody can react on it. And then these reactions as well as the comments and questions gathered during the Round Table would be used to draft the final version. As I said, the aim is to finalize the work by the end of the year. Secondly, the review of the Strategy implementation and of its results against performance indicators would be done on a regular basis while individual actions would be progressively implemented.